Lighthouse condos in Gulf Shores on Alabama's beautiful gulf coast are an excellent vacation home or real estate investment with benefits and make a perfect great family vacation destination, the property is convenient to many of Gulf Shores favorite attractions, public parks, restaurants and outdoor activities such as deep-sea fishing, golf courses, snorkeling, kayaks and more. Find the perfect Gulf Shores AL beach condominium home and start enjoying the best in coastal living. Lighthouse Condominium is a twenty-story building, including 18 levels for units, and two-levels to accommodate parking. The development was finished in 2006 and includes a total of 251 condos. The floor-plans range from 1-Bedroom-2 Bath with 875 +/- sq.ft., 2 Bedroom-2 Bath with 1150 +/- sq.ft., 3 Bedroom-3 Bath with 1500 +/- sq.ft. to 4 Bedroom-4 Baths with 2400 +/- sq.ft. – all condominiums have a spacious Gulf-front balconies overlooking the beautiful white-sand beaches and emerald waters of the Gulf of Mexico. 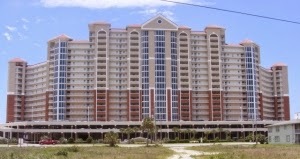 Put Lighthouse Condos in Gulf Shores Alabama on your bucket list and discover why this beachfront property is so popular with vacation destination and real estate investment. Browse Properties By Price & Size, View Photos, etc.